New York City subway dispatcher Walter Garber's (Denzel Washington) ordinary day is thrown into chaos by an audacious crime: the hijacking of a subway train. Ryder (John Travolta), a criminal mastermind, leads a highly-armed gang of four, threatening to execute the train's passengers unless a large ransom is paid within one hour. As the tension mounts beneath his feet, Garber employs his vast knowledge of the subway system in a battle to outwit Ryder and save the hostages. But there's one riddle Garber can't solve: even if the thieves get the money, how can they possibly escape? 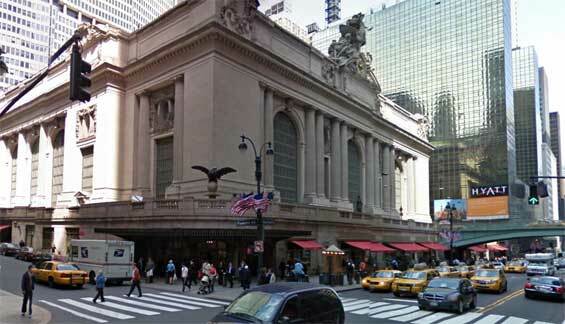 Grand Central Terminal, 89 East 42nd Street and Vanderbilt Avenue, Manhattan. The Manhattan Bridge is a suspension bridge that crosses the East River in New York City, connecting Lower Manhattan (at Canal Street) with Brooklyn (at Flatbush Avenue Extension) on Long Island. It was the last of the three suspension bridges built across the lower East River, following the Brooklyn and the Williamsburg bridges. The bridge was opened to traffic on December 31, 1909 and was designed and built by Polish bridge engineer Ralph Modjeski with the deflection cables designed by Leon Moisseiff, who later designed the infamous original Tacoma Narrows Bridge that opened and collapsed in 1940. It has four vehicle lanes on the upper level (split btw two roadways). The lower level has three lanes, four subway tracks, a walkway and a bikeway. The upper level, originally used for streetcars, has two lanes in each direction, and the lower level is one-way and has three lanes in peak direction. It once carried New York State Route 27 and later was planned to carry Interstate 478. 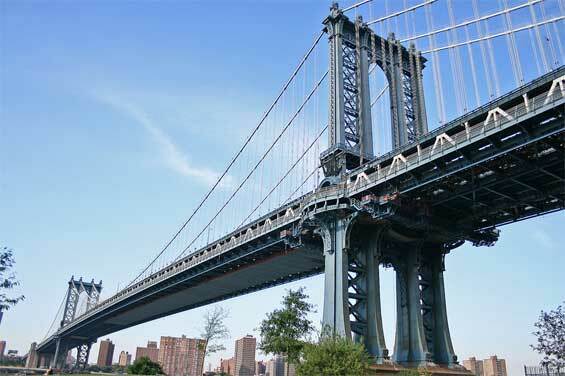 No tolls are charged for motor vehicles to use Manhattan Bridge. 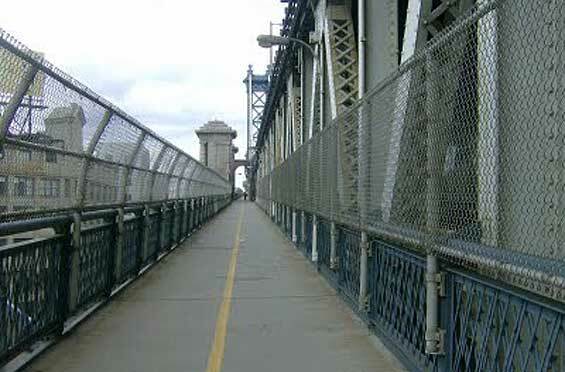 The original pedestrian walkway on the south side of the bridge was reopened after sixty years in June 2001. It was also used by bicycles until late summer 2004, when a dedicated bicycle path was opened on the north side of the bridge, and again in 2007 while the bike lane was used for truck access during repairs to the lower motor roadway. The Manhattan Bridge has featured in several films over the years, including Ghostbusters when Ray Stantz and Winston Zeddemore drive across the bridge. In The Cowboy Way, the two main cowboy characters chase a B train over the bridge to rescue a friend in grave danger. The alien spacecraft that destroys New York in Independence Day makes its entrance over the Manhattan Bridge. The bridge is featured prominently in director Peter Jackson's 2005 remake of King Kong. In the 1930s period a very steep, simple ramp was used by automobiles to access the Bridge, in contrast to today's integrated gradual ramp system into the surrounding roadways. The bridge played a large role in the 1984 Steve Martin romantic comedy film The Lonely Guy, in which it is a popular spot for lonely guys to commit suicide, and the meeting place for Steve Martin and Judith Ivey. In 1998, the film Deep Impact. When the giant wave destroys the Brooklyn Bridge, you can see at the bottom of the frame the Manhattan Bridge. The 2007 film I Am Legend shows the Brooklyn and Manhattan Bridges with their centre spans destroyed. 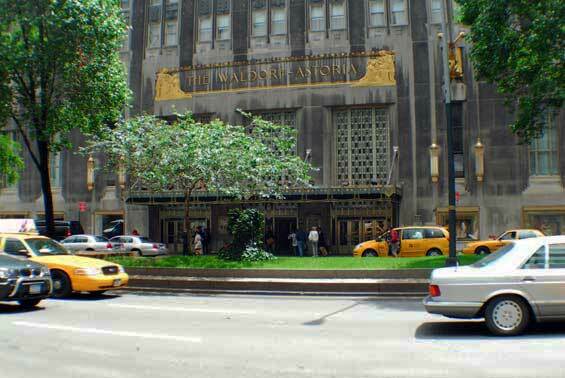 A flashback reveals they were hit by missiles to stop the exodus from a quarantined Manhattan. The bridge is seen in the background of the movie Cloverfield as the monster attacks and destroys the Brooklyn Bridge.